Learn more about hand trucks at A Plus Warehouse. Customers love our Dual Purpose Hand Truck. This is because it works as both a hand truck and platform truck. Everyone likes a two in one! 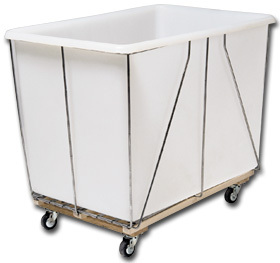 Although this item is both a hand truck and platform truck, it falls under the hand truck section. People that need to carry heavy items from one place to another need hand trucks. Lifting items manually can cause back damage and will be just plainly annoying. With a hand truck, there is no hassle, just load and go. A Plus Warehouse asks customers why should make things tougher on themselves if they do not need to. A Plus Warehouse offers hand trucks of different capacities and made by different manufacturers. The company offers a wide variety of products. 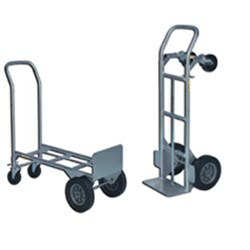 Some items in the hand truck line include but are not limited to heavy duty handle truck, industrial strength hand truck, and the wooden handle trucks. It is now time to discuss the Dual Purpose Hand Truck. 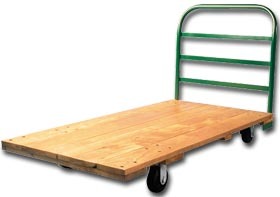 As mentioned earlier, this product functions as both a hand truck and a platform truck. This is shown in the image to the right. The platform position is normally used for heavier loads. This item is in stock for immediate delivery. Customers will not be disappointed when ordering this item. 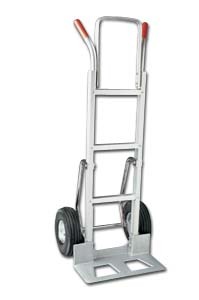 Customers should order a Dual Purpose Hand Truck from A Plus Warehouse today, your right source right now. For more information don’t hesitate to call A Plus Warehouse’s friendly salespeople as well.